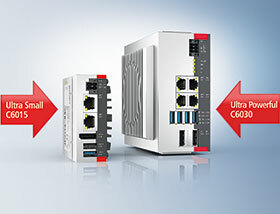 With highly flexible application options, the new series of ultra-compact Beckhoff Industrial PCs that first launched with the C6015 has proven to be extremely successful. With the addition of the new, C6030, the advantages of small space requirements, universal applicability and flexible installation are now also available for complex applications with the highest performance requirements. The multi-core computer, with a size of only 132 x 132 x 67 mm, integrates Intel Core i-series processors of the 6th and 7th Generation to provide ample computing power and offer maximum performance with up to 3,6 GHz per core. The ultra compact C6030 IPC is only half the size of the closest comparable control cabinet PC, the C6930, yet it offers more interfaces even in its basic configuration. Depending on the features included, the C6030 offers price savings of up to 34% over comparable IPCs in the C69xx series. This means that enormous computing power and a comprehensive range of features is available in the space-saving form factor of the C6030, which is able to accommodate almost any automation and visualisation task, including highly complex axis control, demanding HMI applications, large-volume data handling, and applications with extremely short cycle times. The onboard Ethernet adaptor with four 100/1000Base-T connectors, four USB 3.0 ports and two DisplayPort connectors make it ideal for networking and high-performance Ethernet-based control tasks. Both the new ultra-compact motherboard and the robust die-cast zinc and aluminium housing have been newly developed, taking into account all the typical Beckhoff design considerations such as: industrial suitability, as well as dependable reliability and a high quality look and feel. Due to an extremely long-lasting, controlled fan with double ball bearings, the unit is able to accommodate an ambient operating temperature range up to 55°C, depending on the selected CPU. As the newest addition to the ultra-compact Industrial PC series, the C6030 also proves to be extremely flexible in terms of installation. It can be attached at its rear or side panel, vertically or horizontally as required, with free orientation of the connector level. This permits a wide variety of installation scenarios and efficient cable management, even in confined spaces.